A lot of the board games that we play are ones that come with a flat board, they have various playing pieces but the thing that is fairly standard is they all have some sort of playing board and all the action happens on this board. 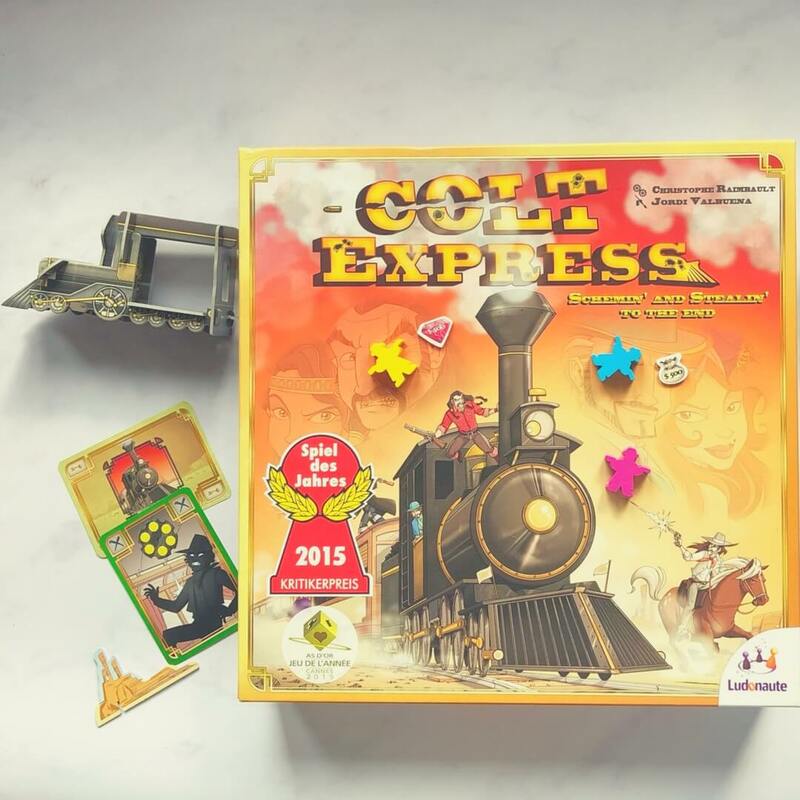 Colt Express is one of those games that doesn't conform to this, while it is a board game it doesn't have a playing board - all the action happens on a train! It's 1899 and the Union Pacific Express is headed north to deliver its payroll and forty-seven passengers. 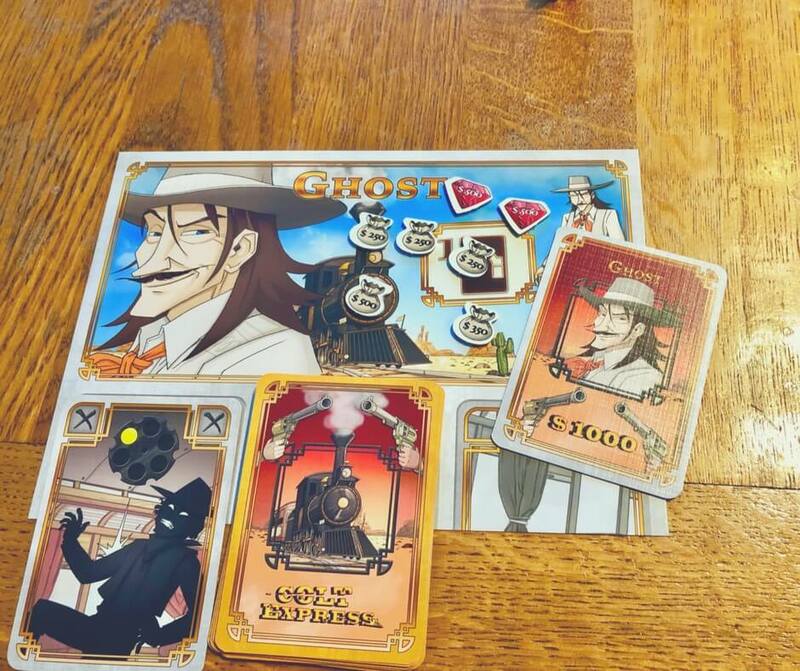 Suddenly the train is attacked by a host of thieving bandits aiming to become the richest outlaw of the Old West! 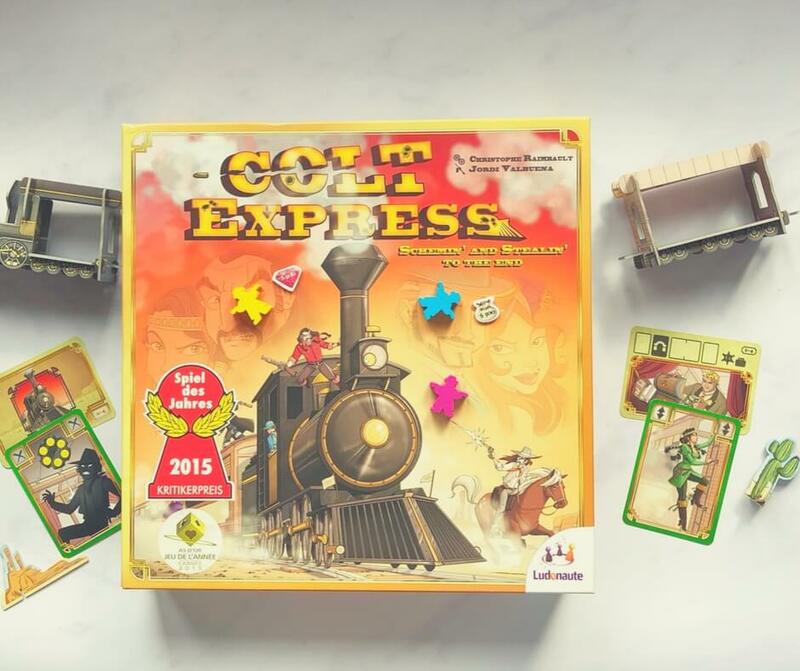 The award-winning Colt Express invites players to take on the role of the outlaws, battling to collect the most loot from a detailed three-dimensional train. 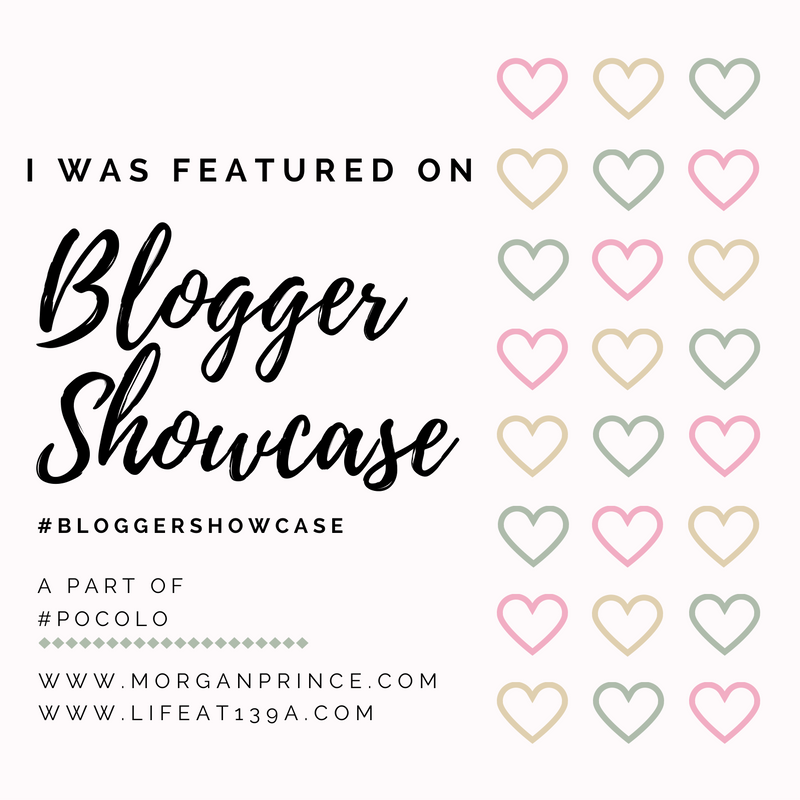 Will the outlaws keep their cool or will the marshal save the day and prevent the stealin'? All that matters is which outlaw is the riches when the train pulls into the station! 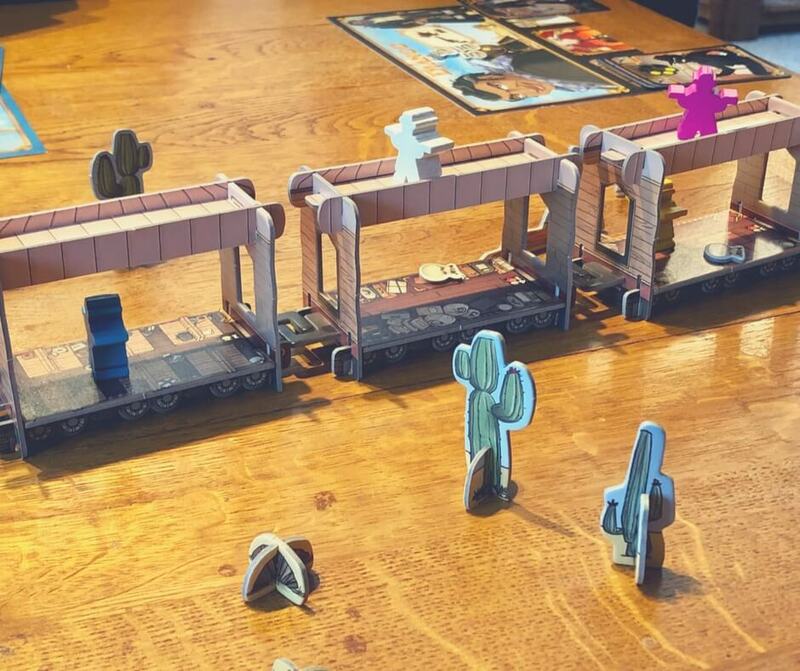 The game takes a little more setup than other games the first time you open it, there are cacti to put together and a train to build. Once all your bits and pieces are built you pick 4 carriages for your train, add loot (money bags and diamonds) according to the type of carriages you have and get your players ready. 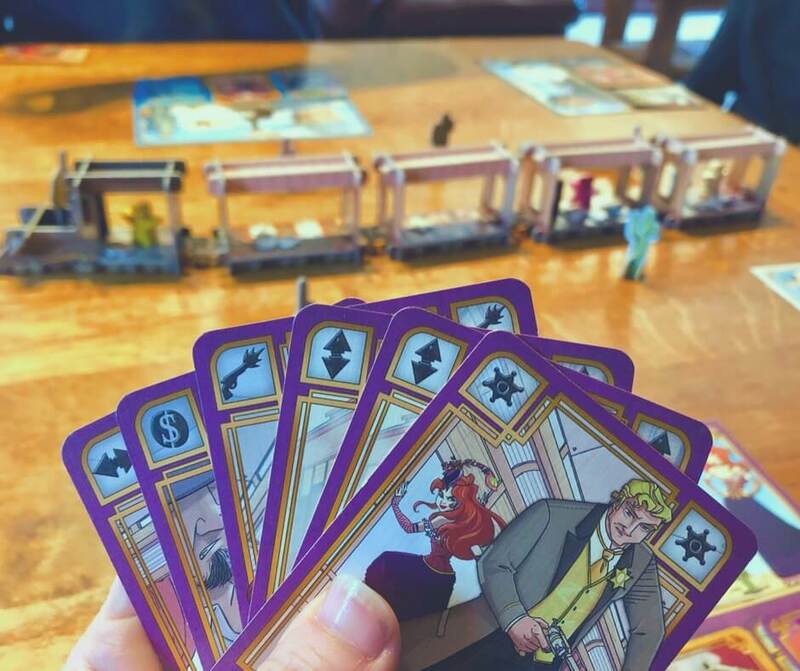 Players begin the game in the back 2 carriages of the train, the marshal stands in the front of the train, guarding a case full of loot. 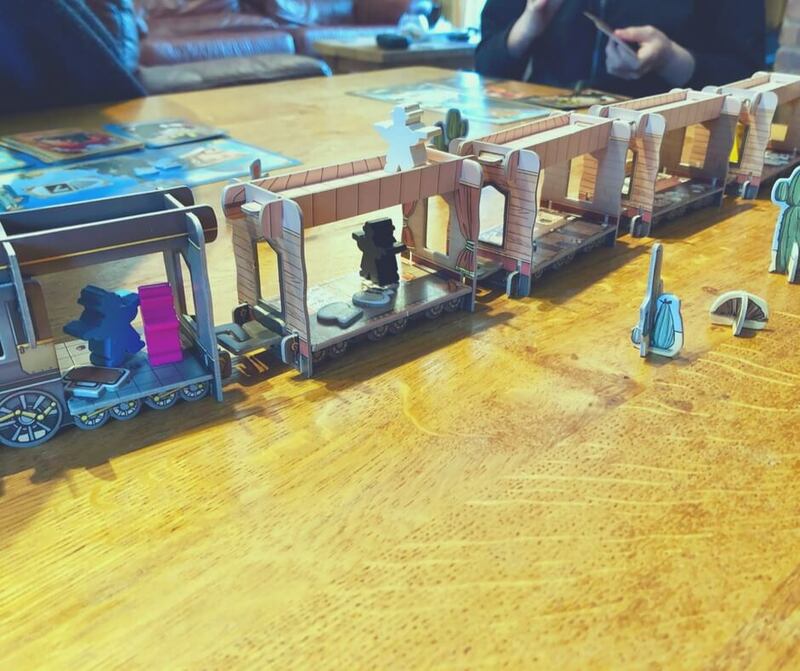 Your train sits in the middle of the play area but should be accessible to all players so they can move their pieces around and steal loot. You can add cacti and rocks to your playing area too. 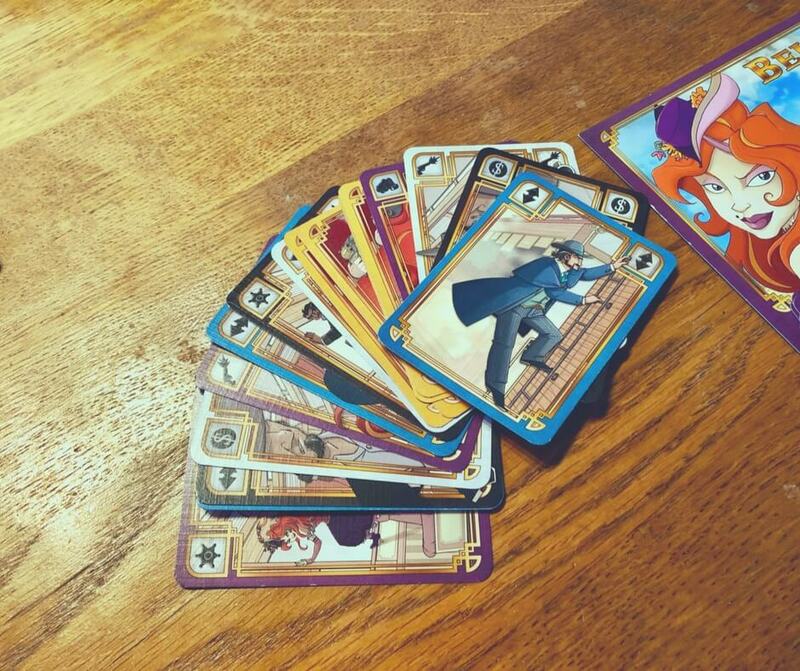 Each player has a player board to keep your cards organised and you're given your sets of cards, that's Activity cards, and bullet cards, as well as a bonus card for later. You're also given 1 money bag to start the game. 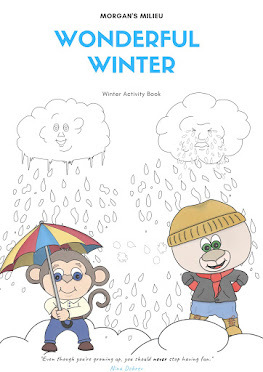 Each player takes a turn to choose an Activity card to place it in a pile in the middle of the play area, play goes around the table with each player placing cards until the sequence (according to your play card) is finished. 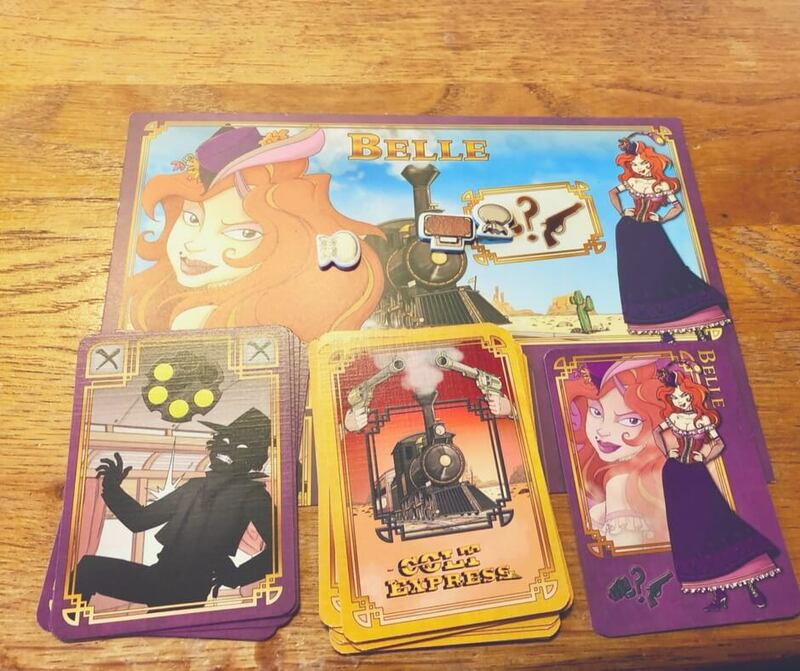 When placing an Activity card you can choose a move card which allows you to move through carriages or go up on the roof (or back down) of the train, a shoot card which lets you try to shoot one of your opponents, a steal card which lets you steal loot from one of the carriages, a punch card which lets you try to punch an opponent and steal some of their loot, or a marshal card which allows you to move the marshal. You have to try to keep track of all your (and your opponents') moves, which is difficult, and attempt to steal the most loot before the end of the game. 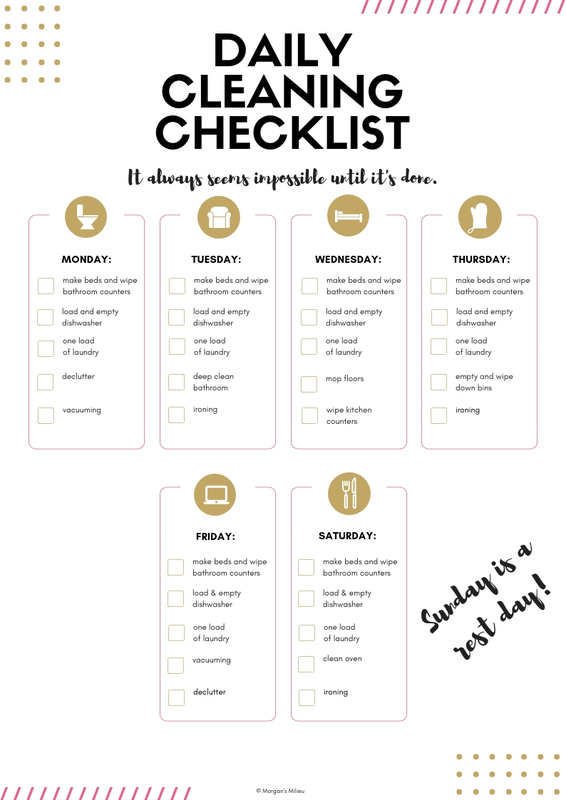 Keeping track is so difficult that you will often find yourself punching the air or stealing nothing! The aim of the game is to have the most loot by the end of the game, but you can sneak a win if you've shot your opponents enough times - there's a bonus $1000 for the most bullets shot! 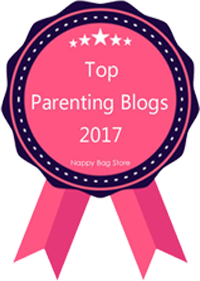 When the board games came out of the cupboard when I was a kid, I had to beat my two brothers every time. The boys love this game. It's fun and it's not just a flat board so they get to move around their character, pick up loot, and shoot or punch (not literally!) each other or me or their dad. 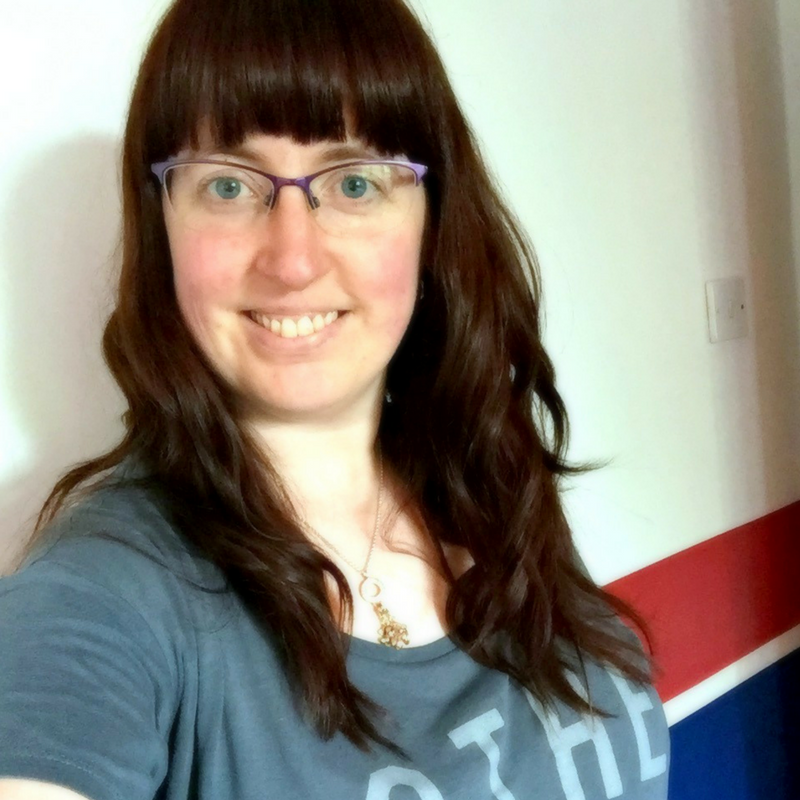 While it can be difficult to keep track of moves it's still a fun game and despite punching the air or shooting no-one we still manage to have fun. It is fun watching everyone shooting each other or trying to get someone back for punching them. 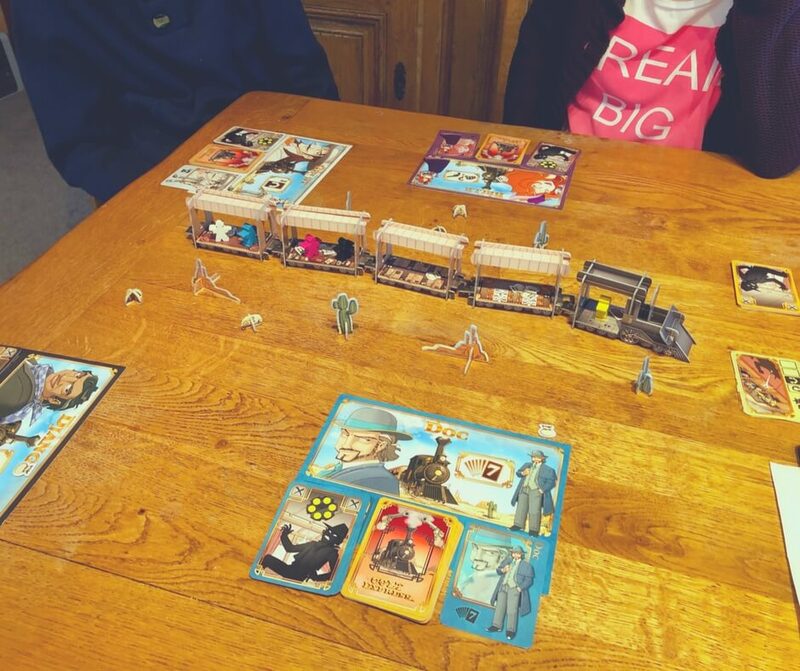 Colt Express is great fun and I'd recommend it for older children, I know the recommended age is 10+ but LP, aged 8 (almost 9), can play with no trouble. There is a more complicated mode to the game too that we have yet to try out. This adds to the fun though because it means if we ever get bored of the standard game we can change it up and enjoy the game again! 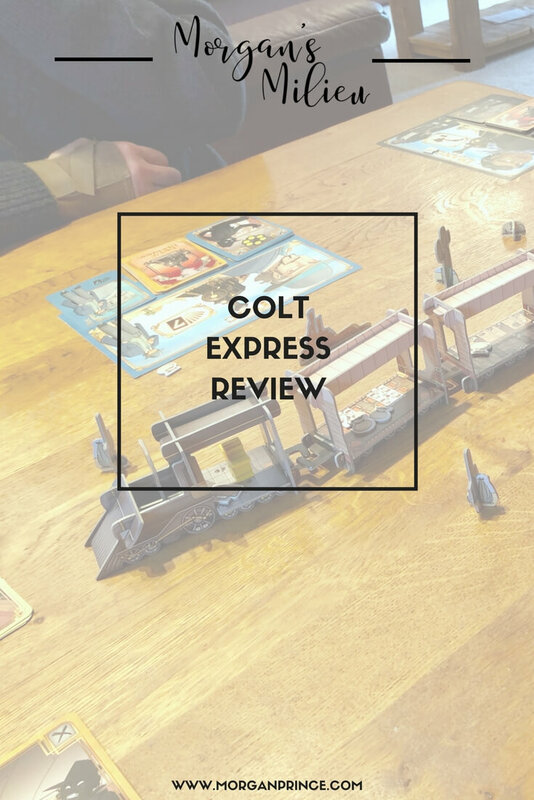 Have you ever played Colt Express - what did you think? 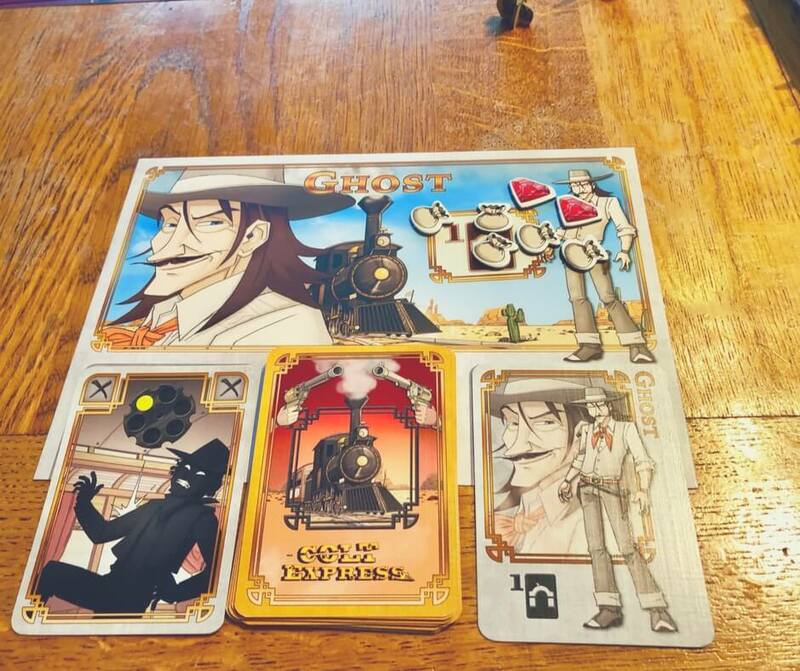 I was sent Colt Express free of charge as part of Blogger Board Game Club in order to review. All opinions are my own.